My little baby girl turned one today. HAPPY BIRTHDAY BABY GAGA! I know it sounds cliched, but I really can't believe a year has gone by so quickly. 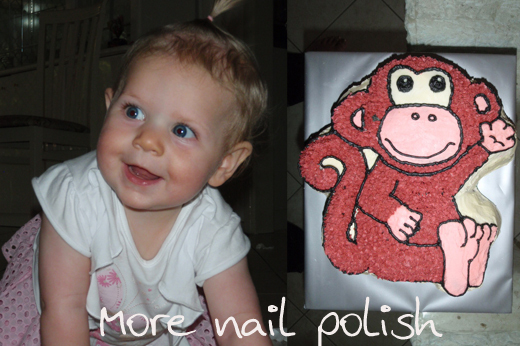 Here's my little one, together with her pink monkey birthday cake I made. For her birthday today I wore one of my new polishes I got off ebay, from the Color Club Beyond the Mistletoe collection. I can't tell you how much I love this collection! This is Sugar Plum Fairy, and it just seemed to match the occasion. This is just one coat of Sugar Plum Fairy over violet coloured franken I made last year out of TKB pigment called Ultramarine Violet. 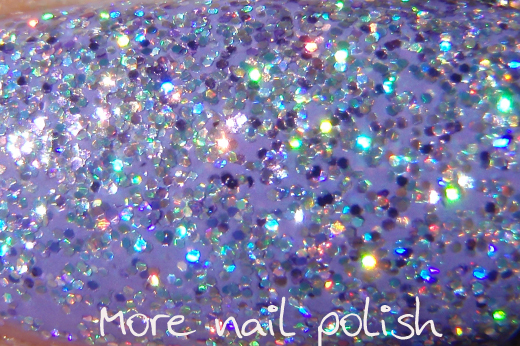 The glitter in this polish is predominately holographic, but with enough lavender/violet glitter colour the overall appearance of the polish. The base is totally clear. You could easily get opacity wearing three coats. 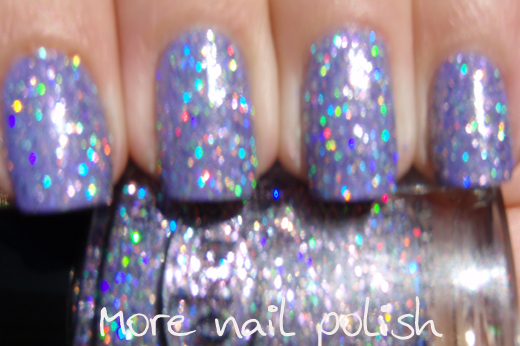 Here is the standard blurry shot as it shows the holo glitter sparkles so nicely. And here it is in the shade where you can't really see the glitter sparkling. The glitter in this collection are very thirsty. I'm wore four coats of top coat. Color Club top coat that came with the set, gelous, Ulta3 Non-chip and Seche Vite. Even with all that top coat there are still sections with that much top coat on! I'm so in love with these polishes! 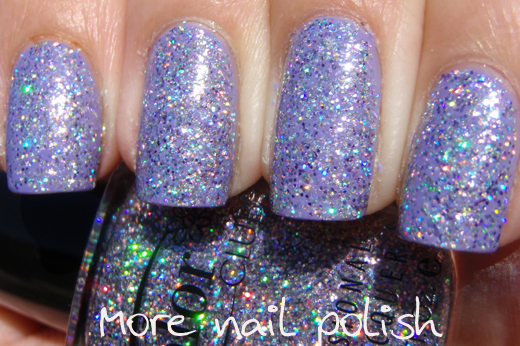 If you like glitter polishes, then it really is a no brainer that you HAVE to get this collection. Hope your having a great weekend. Mine should be a little quieter now that the Birthday and party are over with. And This plish is awesome!! Heppy birthday to your sweet daughter! She's so cute! 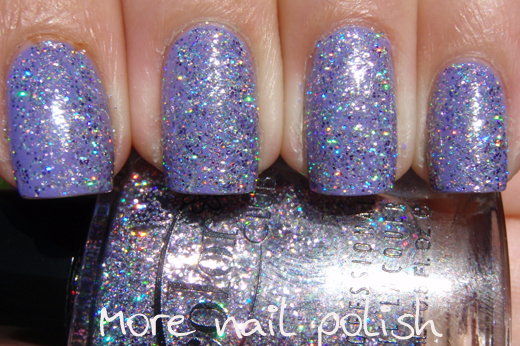 And sugarplum fairy is so beautiful! I have it too and I've worn it for the New Year's Eve! Great effect! Oh what a sweetheart she is! Who did you buy these off on eBay? I dying to Holiday Splendour! Aww she is so beautiful!!! <3 nice manicure btw, it looks GREAT!!! Gorgeous color and franken! Happy Birthday to your baby! Happy birthday to the little sweet one. And man, what a delicious looking cake!! Yum!! Such a cutie-pie - what a heart stealer she will grow up to be. Happy Birthday to your little girl. The mani - it is awesome I need these in my collection too! She's so pretty! Happy birthday, cutie pie. Thanks you everyone for your lovely comments about my fairly princess. Aly - the seller I got my set from is no longer selling the full collection, which is a bummer, cause I got them for a steal and I would dearly love to get my mum a set too. I only see single bottles available now. Awwww! Congrats on the BIG 1! Adorable cake and amazing mani! 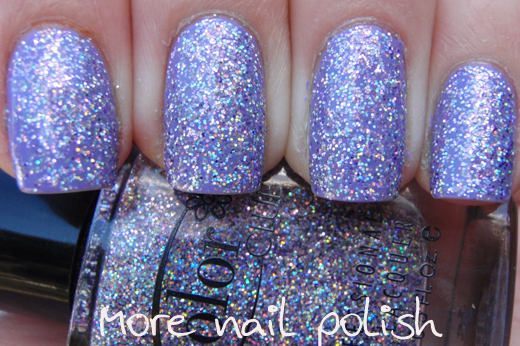 I just ordered Sugar Plum Fairy I should have it Tuesday but now I'm dying to try on over a lavender like this. Your little princess is so pretty. I only have boys. Boys are great in their own way too. I got the beyond the mistletoe collection. It's amazing. They wear forever but are a true pain to remove, like most glitters.